Narrated by Ewan McGregor, the American Public-Television distributed ISLANDS ON THE EDGE offers a fascinating look at one of the world’s most remote but striking locations. Filmed over the course of a year, Scotland’s enigmatic Hebrides islands offer unrivalled dramatic scenes of contrasting natural forces. From violent winter storms to thrashing volcanic rock to golden summer evenings on sandy beaches, this is the story of the ebb and flow of nature at its most powerful. The extreme conditions give rise to amazing tales of survival as we follow families of local animals through key moments in their life cycle, from grey seals trying to protect their young from giant waves, to puffins, eagles and basking sharks. This is wildlife at its purest. Using pioneering underwater macro, aerial and infra-red cinematography, ISLANDS ON THE EDGE delivers unrivalled content, presenting a landscape that few of us will ever experience firsthand. In this first episode, autumn arrives with a vengeance. Young swallows, otters and grey seals face up to the biggest storms and highest tides of the year as they move towards independence. Tens of thousands of geese and swans arrive for the winter only to find predatory white-tailed eagles hungry and ready to hunt them. And on the Isle of Rum, a mighty stag faces the ultimate challenge in a battle to decide the true Monarch of the Glen. In most years winter is the hardest time in the Hebrides but once in a generation the spring turns out to be harder still. In the second program of this landmark series, the ISLANDS ON THE EDGE are hit by the biggest storm in living memory. As the drama unfolds we follow the lives of white-tailed eagles, harbor seals, hares, pine martens and short-eared owls as they struggle to raise their families. When the wild weather finally passes and the seas warm, the story moves beneath the waves to reveal the arrival of Scotlandís Ocean juggernauts — basking sharks! 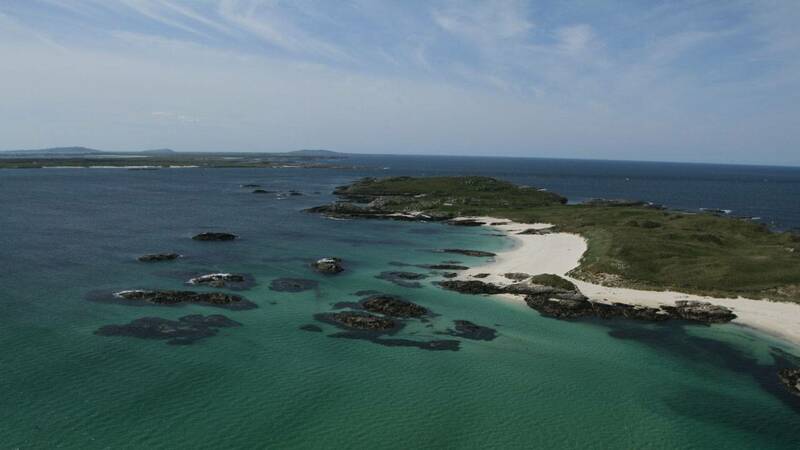 Of all the ISLANDS ON THE EDGE, the Outer Hebrides are the most exposed to the full power of the Atlantic. Despite this, the wildlife here is the most spectacular in Europe. On the outlying islands, seabirds rush to feed their chicks while avoiding the murderous intentions of "bonxies" — predatory skuas with a taste for young puffins. On the low-lying Uists, acres of beautiful meadows burst into flower as summer finally arrives. But this is a year of drought and Atlantic salmon find themselves trapped in the sea pools and unable to move into the river systems. Yet again, the creatures of the Hebrides must find ways to survive the extremes of their unforgiving habitat. In the final program of the series, we meet the people of the Hebrides and discover how they're learning to live side-by-side with their wild neighbors. Ferryman Donnie McDonald from Skye has discovered that business can prosper if your passengers can be treated to some on-board entertainment in the form of white-tailed eagles hunting alongside the boat. We also meet Andrew Abrahams, who's attempting to turn the Island of Colonsay into a nature reserve for bees, Alice Starmore, an artist inspired by the peatlands of Lewis, and Innes Henderson, the Coll fisherman who regularly has to steer his boat through a 100 strong group of basking sharks!